The chromatin remodeling factor CHD7 is frequently mutated in CHARGE syndrome. Whittaker et al. identify a role for the chromatin remodeling factor CHD7 in the expansion of cerebellar granule progenitor cells. 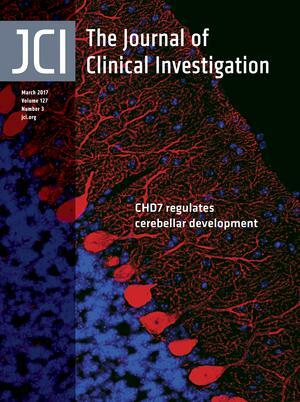 The cover image shows immuno­staining of Purkinje cells (red) and DAPI staining of nuclei (blue) in the cerebellar vermis of a 21-day-old wild-type mouse. Citation Information: J Clin Invest. 2017;127(3):735-736. https://doi.org/10.1172/JCI93276. On January 27, 2017, President Trump signed an executive order banning the citizens of 7 countries from obtaining US entry visas for the next 90 days. Since the announcement, the news media have devoted a large portion of their coverage to the ban and its political ramifications. There have been arguments made by both sides that the ban will make our country safer, while others have argued that this executive order will result in the weakening of our country and bolstering of our enemies. As a physician-scientist who was born in Iran and immigrated to the US, I will stay away from the politics of this executive order; rather, I want to discuss the impact of the immigration ban on scientific discourse, education, and research programs, and how it may influence the dissemination of knowledge to physicians and scientists in low- and middle-income countries. I will use my own experience as an example of how the educational and scientific systems in this country benefit those who strive to learn in a free and intellectually stimulating environment. Citation Information: J Clin Invest. 2017;127(3):737-749. https://doi.org/10.1172/JCI84417. Chikungunya virus (CHIKV), a reemerging arbovirus, causes a crippling musculoskeletal inflammatory disease in humans characterized by fever, polyarthralgia, myalgia, rash, and headache. CHIKV is transmitted by Aedes species of mosquitoes and is capable of an epidemic, urban transmission cycle with high rates of infection. Since 2004, CHIKV has spread to new areas, causing disease on a global scale, and the potential for CHIKV epidemics remains high. Although CHIKV has caused millions of cases of disease and significant economic burden in affected areas, no licensed vaccines or antiviral therapies are available. In this Review, we describe CHIKV epidemiology, replication cycle, pathogenesis and host immune responses, and prospects for effective vaccines and highlight important questions for future research. Citation Information: J Clin Invest. 2017;127(3):750-760. https://doi.org/10.1172/JCI89741. Citation Information: J Clin Invest. 2017;127(3):761-771. https://doi.org/10.1172/JCI84424. Many RNA species have been identified as important players in the development of chronic diseases, including cancer. Over the past decade, numerous studies have highlighted how regulatory RNAs such as microRNAs (miRNAs) and long noncoding RNAs (lncRNAs) play crucial roles in the development of a disease state. It is clear that the aberrant expression of miRNAs promotes tumor initiation and progression, is linked with cardiac dysfunction, allows for the improper physiological response in maintaining glucose and insulin levels, and can prevent the appropriate integration of neuronal networks, resulting in neurodegenerative disorders. Because of this, there has been a major effort to therapeutically target these noncoding RNAs. In just the past 5 years, over 100 antisense oligonucleotide–based therapies have been tested in phase I clinical trials, a quarter of which have reached phase II/III. Most notable are fomivirsen and mipomersen, which have received FDA approval to treat cytomegalovirus retinitis and high blood cholesterol, respectively. The continued improvement of innovative RNA modifications and delivery entities, such as nanoparticles, will aid in the development of future RNA-based therapeutics for a broader range of chronic diseases. Here we summarize the latest promises and challenges of targeting noncoding RNAs in disease. Citation Information: J Clin Invest. 2017;127(3):772-779. https://doi.org/10.1172/JCI85113. Regulatory B cells (Bregs) modulate immune responses predominantly, although not exclusively, via the release of IL-10. The importance of human Bregs in the maintenance of immune homeostasis comes from a variety of immune-related pathologies, such as autoimmune diseases, cancers, and chronic infections that are often associated with abnormalities in Breg numbers or function. A continuous effort toward understanding Breg biology in healthy individuals will provide new opportunities to develop Breg immunotherapy that could prove beneficial in treating various immune-mediated pathologies. In this Review, we discuss findings regarding human Bregs, including their mechanisms of suppression and role in different disease settings. We also propose several therapeutic strategies targeting Bregs for better management of immune disorders. Citation Information: J Clin Invest. 2017;127(3):780-789. https://doi.org/10.1172/JCI90962. In addition to being a component of innate immunity and an ancient defense mechanism against invading pathogens, complement activation also participates in the adaptive immune response, inflammation, hemostasis, embryogenesis, and organ repair and development. Activation of the complement system via classical, lectin, or alternative pathways generates anaphylatoxins (C3a and C5a) and membrane attack complex (C5b-9) and opsonizes targeted cells. Complement activation end products and their receptors mediate cell-cell interactions that regulate several biological functions in the extravascular tissue. Signaling of anaphylatoxin receptors or assembly of membrane attack complex promotes cell dedifferentiation, proliferation, and migration in addition to reducing apoptosis. As a result, complement activation in the tumor microenvironment enhances tumor growth and increases metastasis. In this Review, I discuss immune and nonimmune functions of complement proteins and the tumor-promoting effect of complement activation. Citation Information: J Clin Invest. 2017;127(3):790-792. https://doi.org/10.1172/JCI92823. Blood vessels have a unified mission to circulate blood throughout the body; however, they have additional diverse and specialized roles in various organs. For example, in the liver, discontinuous sinusoids, which are fenestrated capillaries with intercellular gaps and a fragmented basement membrane, facilitate delivery of macromolecules to highly metabolic hepatocytes. During embryonic development, discontinuous sinusoids also allow circulating hematopoietic progenitor and stem cells to populate the liver and promote blood cell differentiation. In this issue of the JCI, Géraud et al. describe an essential role for the transcription factor GATA4 in promoting the development of discontinuous sinusoids. In the absence of liver sinusoidal GATA4, mouse embryos developed hepatic capillaries with upregulated endothelial cell junction proteins and a continuous basement membrane. These features prevented hematopoietic progenitor cells from transmigrating into the developing liver, and Gata4-mutant embryos died from subsequent liver hypoplasia and anemia. This study highlights the surprising and extensive transcriptional control GATA4 exercises over specialized liver vascular development and function. Citation Information: J Clin Invest. 2017;127(3):793-795. https://doi.org/10.1172/JCI92845. Glucagon-like peptide 1 receptor (GLP-1R) signaling in the CNS has been linked to reduced food intake, lower body weight, improved glucose homeostasis, and activation of CNS stress axes. GLP-1 is produced by cells that express proglucagon (GCG); however, the stimuli that activate GCG+ neurons are not well known, which has made understanding the role of this neuronal population in the CNS a challenge. In this issue of the JCI, Gaykema et al. use designer receptors exclusively activated by designer drugs (DREADD) technology to specifically activate GCG+ neurons in mouse models. While activation of GCG+ neurons did reduce food intake, and variably decreased hepatic glucose production, other GLP-1–associated effects were not observed — e.g., activation of stress axes or stimulation of insulin secretion — in response to GCG+ neuron activation. The authors have provided a valuable model to study this set of neurons in vivo, and their results provide new insights into the function of GCG+ neural activity in the brain and raise questions that will move research on this clinically relevant neural system forward. Citation Information: J Clin Invest. 2017;127(3):796-797. https://doi.org/10.1172/JCI92846. MicroRNAs (miRNAs) have emerged as important regulators of a variety of biological processes and pathways. In this issue of the JCI, Ahmed et al. reveal that miR-7a2 is a critical regulator of sexual maturation and reproductive function, as mice lacking miR-7a2 develop hypogonadotropic hypogonadism and infertility. Using a bioinformatics approach, the authors identified several miR-7a2 target genes and pathways that have not been previously associated with gonadotropin biosynthesis and/or secretion. Together, these results identify miR-7a2–regulated genes involved in reproductive hormone biosynthesis pathways and provide a framework for future studies aimed at understanding rare reproductive conditions. Citation Information: J Clin Invest. 2017;127(3):798-800. https://doi.org/10.1172/JCI92847. Citation Information: J Clin Invest. 2017;127(3):801-813. https://doi.org/10.1172/JCI82976. Elevated expression of the chemokine receptor CCR4 in tumors is associated with poor prognosis in several cancers. Here, we have determined that CCR4 was highly expressed in human renal cell carcinoma (RCC) biopsies and observed abnormal levels of CCR4 ligands in RCC patient plasma. An antagonistic anti-CCR4 antibody had antitumor activity in the RENCA mouse model of RCC. CCR4 inhibition did not reduce the proportion of infiltrating leukocytes in the tumor microenvironment but altered the phenotype of myeloid cells, increased NK cell and Th1 cytokine levels, and reduced immature myeloid cell infiltrate and blood chemokine levels. In spite of prominent changes in the myeloid compartment, the anti-CCR4 antibody did not affect RENCA tumors in T cell–deficient mice, and treatment with an anti–class II MHC antibody abrogated its antitumor activity. We concluded that the effects of the anti-CCR4 antibody required the adaptive immune system and CD4+ T cells. Moreover, CCL17-induced IFN-γ production was reduced when Th1-polarized normal CD4+ T cells were exposed to the CCR4 ligand, evidencing the involvement of CCR4 in Th1/Th2 regulation. The anti-CCR4 antibody, alone or in combination with other immune modulators, is a potential treatment approach to human solid cancers with high levels of CCR4-expressing tumor-infiltrating leukocytes and abnormal plasma CCR4 ligand levels. Citation Information: J Clin Invest. 2017;127(3):814-829. https://doi.org/10.1172/JCI86154. Citation Information: J Clin Invest. 2017;127(3):843-856. https://doi.org/10.1172/JCI88720. Type I IFNs promote cellular responses to viruses, and IFN receptor (IFNAR) signaling regulates the responses of endothelial cells of the blood-brain barrier (BBB) during neurotropic viral infection. However, the role of astrocytes in innate immune responses of the BBB during viral infection of the CNS remains to be fully elucidated. Here, we have demonstrated that type I IFNAR signaling in astrocytes regulates BBB permeability and protects the cerebellum from infection and immunopathology. Mice with astrocyte-specific loss of IFNAR signaling showed decreased survival after West Nile virus infection. Accelerated mortality was not due to expanded viral tropism or increased replication. Rather, viral entry increased specifically in the hindbrain of IFNAR-deficient mice, suggesting that IFNAR signaling critically regulates BBB permeability in this brain region. Pattern recognition receptors and IFN-stimulated genes had higher basal and IFN-induced expression in human and mouse cerebellar astrocytes than did cerebral cortical astrocytes, suggesting that IFNAR signaling has brain region–specific roles in CNS immune responses. Taken together, our data identify cerebellar astrocytes as key responders to viral infection and highlight the existence of distinct innate immune programs in astrocytes from evolutionarily disparate regions of the CNS. Citation Information: J Clin Invest. 2017;127(3):857-873. https://doi.org/10.1172/JCI90025. Long-acting anti-HIV products can substantively change the standard of care for patients with HIV/AIDS. To this end, hydrophobic antiretroviral drugs (ARVs) were recently developed for parenteral administration at monthly or longer intervals. While shorter-acting hydrophilic drugs can be made into nanocarrier-encased prodrugs, the nanocarrier encasement must be boosted to establish long-acting ARV depots. The mixed-lineage kinase 3 (MLK-3) inhibitor URMC-099 provides this function by affecting autophagy. Here, we have shown that URMC-099 facilitates ARV sequestration and its antiretroviral responses by promoting the nuclear translocation of the transcription factor EB (TFEB). In monocyte-derived macrophages, URMC-099 induction of autophagy led to retention of nanoparticles containing the antiretroviral protease inhibitor atazanavir. These nanoparticles were localized within macrophage autophagosomes, leading to a 4-fold enhancement of mitochondrial and cell vitality. In rodents, URMC-099 activation of autophagy led to 50-fold increases in the plasma drug concentration of the viral integrase inhibitor dolutegravir. These data paralleled URMC-099–mediated induction of autophagy and the previously reported antiretroviral responses in HIV-1–infected humanized mice. We conclude that pharmacologic induction of autophagy provides a means to extend the action of a long-acting, slow, effective release of antiretroviral therapy. Citation Information: J Clin Invest. 2017;127(3):888-898. https://doi.org/10.1172/JCI88508. The most frequent focal alterations in human retinoblastoma are mutations in the tumor-suppressor gene retinoblastoma (RB) and amplification of the oncogene MYCN. Whether MYCN overexpression drives retinoblastoma has not been assessed in model systems. Here, we have shown that Rb inactivation collaborates strongly with MYCN overexpression and leads to retinoblastoma in mice. Overexpression of human MYCN in the context of Rb inactivation increased the expression of MYC-, E2F-, and ribosome-related gene sets, promoted excessive proliferation, and led to retinoblastoma with anaplastic changes. We then modeled responses to MYCN-directed therapy by suppressing MYCN expression in MYCN-driven retinoblastomas. Initially, MYCN suppression led to proliferation arrest and partial tumor regression with loss of anaplasia. However, over time, retinoblastomas reemerged, typically without reactivation of human MYCN or amplification of murine Mycn. A subset of returning retinoblastomas showed genomic amplification of a Mycn target gene encoding the miR cluster miR-17~92, while most retinoblastomas reemerged without clear genetic alterations in either Mycn or known Mycn targets. This Rb/MYCN model recapitulates key genetic driver alterations seen in human retinoblastoma and reveals the emergence of MYCN independence in an initially MYCN-driven tumor. Citation Information: J Clin Invest. 2017;127(3):912-928. https://doi.org/10.1172/JCI89626. Steroid-resistant nephrotic syndrome (SRNS) causes 15% of chronic kidney disease cases. A mutation in 1 of over 40 monogenic genes can be detected in approximately 30% of individuals with SRNS whose symptoms manifest before 25 years of age. However, in many patients, the genetic etiology remains unknown. Here, we have performed whole exome sequencing to identify recessive causes of SRNS. In 7 families with SRNS and facultative ichthyosis, adrenal insufficiency, immunodeficiency, and neurological defects, we identified 9 different recessive mutations in SGPL1, which encodes sphingosine-1-phosphate (S1P) lyase. All mutations resulted in reduced or absent SGPL1 protein and/or enzyme activity. Overexpression of cDNA representing SGPL1 mutations resulted in subcellular mislocalization of SGPL1. Furthermore, expression of WT human SGPL1 rescued growth of SGPL1-deficient dpl1Δ yeast strains, whereas expression of disease-associated variants did not. Immunofluorescence revealed SGPL1 expression in mouse podocytes and mesangial cells. Knockdown of Sgpl1 in rat mesangial cells inhibited cell migration, which was partially rescued by VPC23109, an S1P receptor antagonist. In Drosophila, Sply mutants, which lack SGPL1, displayed a phenotype reminiscent of nephrotic syndrome in nephrocytes. WT Sply, but not the disease-associated variants, rescued this phenotype. Together, these results indicate that SGPL1 mutations cause a syndromic form of SRNS. Citation Information: J Clin Invest. 2017;127(3):929-941. https://doi.org/10.1172/JCI89455. Chimeric antigen receptor (CAR) T cells have been highly successful in treating hematological malignancies, including acute and chronic lymphoblastic leukemia. However, treatment of solid tumors using CAR T cells has been largely unsuccessful to date, partly because of tumor-induced immunosuppressive mechanisms, including adenosine production. Previous studies have shown that adenosine generated by tumor cells potently inhibits endogenous antitumor T cell responses through activation of adenosine 2A receptors (A2ARs). Herein, we have observed that CAR activation resulted in increased A2AR expression and suppression of both murine and human CAR T cells. This was reversible using either A2AR antagonists or genetic targeting of A2AR using shRNA. In 2 syngeneic HER2+ self-antigen tumor models, we found that either genetic or pharmacological targeting of the A2AR profoundly increased CAR T cell efficacy, particularly when combined with PD-1 blockade. Mechanistically, this was associated with increased cytokine production of CD8+ CAR T cells and increased activation of both CD8+ and CD4+ CAR T cells. Given the known clinical relevance of the CD73/adenosine pathway in several solid tumor types, and the initiation of phase I trials for A2AR antagonists in oncology, this approach has high translational potential to enhance CAR T cell efficacy in several cancer types. Citation Information: J Clin Invest. 2017;127(3):942-953. https://doi.org/10.1172/JCI90171. Primary adrenal insufficiency is life threatening and can present alone or in combination with other comorbidities. Here, we have described a primary adrenal insufficiency syndrome and steroid-resistant nephrotic syndrome caused by loss-of-function mutations in sphingosine-1-phosphate lyase (SGPL1). SGPL1 executes the final decisive step of the sphingolipid breakdown pathway, mediating the irreversible cleavage of the lipid-signaling molecule sphingosine-1-phosphate (S1P). Mutations in other upstream components of the pathway lead to harmful accumulation of lysosomal sphingolipid species, which are associated with a series of conditions known as the sphingolipidoses. In this work, we have identified 4 different homozygous mutations, c.665G>A (p.R222Q), c.1633_1635delTTC (p.F545del), c.261+1G>A (p.S65Rfs*6), and c.7dupA (p.S3Kfs*11), in 5 families with the condition. In total, 8 patients were investigated, some of whom also manifested other features, including ichthyosis, primary hypothyroidism, neurological symptoms, and cryptorchidism. Sgpl1–/– mice recapitulated the main characteristics of the human disease with abnormal adrenal and renal morphology. Sgpl1–/– mice displayed disrupted adrenocortical zonation and defective expression of steroidogenic enzymes as well as renal histology in keeping with a glomerular phenotype. In summary, we have identified SGPL1 mutations in humans that perhaps represent a distinct multisystemic disorder of sphingolipid metabolism. Citation Information: J Clin Invest. 2017;127(3):954-969. https://doi.org/10.1172/JCI87880. Defective apoptotic death of activated macrophages has been implicated in the pathogenesis of rheumatoid arthritis (RA). However, the molecular signatures defining apoptotic resistance of RA macrophages are not fully understood. Here, global transcriptome profiling of RA macrophages revealed that the osmoprotective transcription factor nuclear factor of activated T cells 5 (NFAT5) critically regulates diverse pathologic processes in synovial macrophages including the cell cycle, apoptosis, and proliferation. Transcriptomic analysis of NFAT5-deficient macrophages revealed the molecular networks defining cell survival and proliferation. Proinflammatory M1-polarizing stimuli and hypoxic conditions were responsible for enhanced NFAT5 expression in RA macrophages. An in vitro functional study demonstrated that NFAT5-deficient macrophages were more susceptible to apoptotic death. Specifically, CCL2 secretion in an NFAT5-dependent fashion bestowed apoptotic resistance to RA macrophages in vitro. Injection of recombinant CCL2 into one of the affected joints of Nfat5+/– mice increased joint destruction and macrophage infiltration, demonstrating the essential role of the NFAT5/CCL2 axis in arthritis progression in vivo. Moreover, after intra-articular injection, NFAT5-deficient macrophages were more susceptible to apoptosis and less efficient at promoting joint destruction than were NFAT5-sufficient macrophages. Thus, NFAT5 regulates macrophage survival by inducing CCL2 secretion. Our results provide evidence that NFAT5 expression in macrophages enhances chronic arthritis by conferring apoptotic resistance to activated macrophages. Citation Information: J Clin Invest. 2017;127(3):970-981. https://doi.org/10.1172/JCI89412. An intracellular complement system (ICS) has recently been described in immune and nonimmune human cells. This system can be activated in a convertase-independent manner from intracellular stores of the complement component C3. The source of these stores has not been rigorously investigated. In the present study, Western blotting identified a band corresponding to C3 in freshly isolated human peripheral blood cells that was absent in corresponding cell lines. One difference between native cells and cell lines was the time absent from a fluid-phase complement source; therefore, we hypothesized that loading C3 from plasma was a route of establishing intracellular C3 stores. We found that many types of human cells specifically internalized C3(H2O), the hydrolytic product of C3, and not native C3, from the extracellular milieu. Uptake was rapid, saturable, and sensitive to competition with unlabeled C3(H2O), indicating a specific mechanism of loading. Under steady-state conditions, approximately 80% of incorporated C3(H2O) was returned to the extracellular space. These studies identify an ICS recycling pathway for C3(H2O). The loaded C3(H2O) represents a source of C3a, and its uptake altered the cytokine profile of activated CD4+ T cells. Importantly, these results indicate that the impact of soluble plasma factors should be considered when performing in vitro studies assessing cellular immune function. Citation Information: J Clin Invest. 2017;127(3):982-986. https://doi.org/10.1172/JCI91161. Citation Information: J Clin Invest. 2017;127(3):987-1004. https://doi.org/10.1172/JCI89484. A highly orchestrated gene expression program establishes the properties that define mature adipocytes, but the contribution of posttranscriptional factors to the adipocyte phenotype is poorly understood. Here we have shown that the RNA-binding protein PSPC1, a component of the paraspeckle complex, promotes adipogenesis in vitro and is important for mature adipocyte function in vivo. Cross-linking and immunoprecipitation followed by RNA sequencing revealed that PSPC1 binds to intronic and 3′-untranslated regions of a number of adipocyte RNAs, including the RNA encoding the transcriptional regulator EBF1. Purification of the paraspeckle complex from adipocytes further showed that PSPC1 associates with the RNA export factor DDX3X in a differentiation-dependent manner. Remarkably, PSPC1 relocates from the nucleus to the cytoplasm during differentiation, coinciding with enhanced export of adipogenic RNAs. Mice lacking PSPC1 in fat displayed reduced lipid storage and adipose tissue mass and were resistant to diet-induced obesity and insulin resistance due to a compensatory increase in energy expenditure. These findings highlight a role for PSPC1-dependent RNA maturation in the posttranscriptional control of adipose development and function. Citation Information: J Clin Invest. 2017;127(3):1005-1018. https://doi.org/10.1172/JCI90259. Munc13 proteins are essential regulators of neurotransmitter release at nerve cell synapses. They mediate the priming step that renders synaptic vesicles fusion-competent, and their genetic elimination causes a complete block of synaptic transmission. Here we have described a patient displaying a disorder characterized by a dyskinetic movement disorder, developmental delay, and autism. Using whole-exome sequencing, we have shown that this condition is associated with a rare, de novo Pro814Leu variant in the major human Munc13 paralog UNC13A (also known as Munc13-1). Electrophysiological studies in murine neuronal cultures and functional analyses in Caenorhabditis elegans revealed that the UNC13A variant causes a distinct dominant gain of function that is characterized by increased fusion propensity of synaptic vesicles, which leads to increased initial synaptic vesicle release probability and abnormal short-term synaptic plasticity. Our study underscores the critical importance of fine-tuned presynaptic control in normal brain function. Further, it adds the neuronal Munc13 proteins and the synaptic vesicle priming process that they control to the known etiological mechanisms of psychiatric and neurological synaptopathies. Citation Information: J Clin Invest. 2017;127(3):1019-1030. https://doi.org/10.1172/JCI90350. Tissue inflammation is a key component of obesity-induced insulin resistance, with a variety of immune cell types accumulating in adipose tissue. Here, we have demonstrated increased numbers of B2 lymphocytes in obese adipose tissue and have shown that high-fat diet–induced (HFD-induced) insulin resistance is mitigated in B cell-deficient (Bnull) mice. Adoptive transfer of adipose tissue B2 cells (ATB2) from wild-type HFD donor mice into HFD Bnull recipients completely restored the effect of HFD to induce insulin resistance. Recruitment and activation of ATB2 cells was mediated by signaling through the chemokine leukotriene B4 (LTB4) and its receptor LTB4R1. Furthermore, the adverse effects of ATB2 cells on glucose homeostasis were partially dependent upon T cells and macrophages. These results demonstrate the importance of ATB2 cells in obesity-induced insulin resistance and suggest that inhibition of the LTB4/LTB4R1 axis might be a useful approach for developing insulin-sensitizing therapeutics. Citation Information: J Clin Invest. 2017;127(3):1031-1045. https://doi.org/10.1172/JCI81335. Peptides derived from pre-proglucagon (GCG peptides) act in both the periphery and the CNS to change food intake, glucose homeostasis, and metabolic rate while playing a role in anxiety behaviors and physiological responses to stress. Although the actions of GCG peptides produced in the gut and pancreas are well described, the role of glutamatergic GGC peptide–secreting hindbrain neurons in regulating metabolic homeostasis has not been investigated. Here, we have shown that chemogenetic stimulation of GCG-producing neurons reduces metabolic rate and food intake in fed and fasted states and suppresses glucose production without an effect on glucose uptake. Stimulation of GCG neurons had no effect on corticosterone secretion, body weight, or conditioned taste aversion. In the diet-induced obese state, the effects of GCG neuronal stimulation on gluconeogenesis were lost, while the food intake–lowering effects remained, resulting in reductions in body weight and adiposity. Our work suggests that GCG peptide–expressing neurons can alter feeding, metabolic rate, and glucose production independent of their effects on hypothalamic pituitary-adrenal (HPA) axis activation, aversive conditioning, or insulin secretion. We conclude that GCG neurons likely stimulate separate populations of downstream cells to produce a change in food intake and glucose homeostasis and that these effects depend on the metabolic state of the animal. Citation Information: J Clin Invest. 2017;127(3):1061-1074. https://doi.org/10.1172/JCI90031. Citation Information: J Clin Invest. 2017;127(3):1075-1089. https://doi.org/10.1172/JCI90854. Citation Information: J Clin Invest. 2017;127(3):1090-1098. https://doi.org/10.1172/JCI90958. Heparin-induced thrombocytopenia (HIT) is a prothrombotic disorder initiated by antibodies against complexes between human platelet factor 4 (hPF4) and heparin. A better understanding of the events that initiate the prothrombotic state may improve approaches to antithrombotic management. Here, we visualized thrombus formation in an in vivo murine model and an endothelialized microfluidic system that simulate the pathogenesis of HIT. hPF4 released from platelets predominantly bound to peri-injury endothelium and formed HIT antigenic complexes that were dissociated by heparin. In mice expressing both hPF4+ and human platelet IgG Fc receptor IIA (FcγRIIA), infusion of the HIT-like monoclonal antibody KKO increased fibrin and platelet deposition at sites of injury, followed immediately by antigen formation on proximate endothelial cells. After a few minutes, HIT antigen was detected within the thrombus itself at the interface between the platelet core and the surrounding shell. We observed similar results in the humanized, endothelialized microfluidic system. hPF4 and KKO selectively bound to photochemically injured endothelium at sites where surface glycocalyx was reduced. These studies support the concept that the perithrombus endothelium is the predominant site of HIT antigen assembly. This suggests that disrupting antigen formation along the endothelium or protecting the endothelium may provide a therapeutic opportunity to prevent thrombotic complications of HIT, while sparing systemic hemostatic pathways. Citation Information: J Clin Invest. 2017;127(3):1099-1114. https://doi.org/10.1172/JCI90086. Citation Information: J Clin Invest. 2017;127(3):1115-1115. https://doi.org/10.1172/JCI92775. Citation Information: J Clin Invest. 2017;127(3):1116-1116. https://doi.org/10.1172/JCI92099. Citation Information: J Clin Invest. 2017;127(3):1116-1116. https://doi.org/10.1172/JCI93333. Citation Information: J Clin Invest. 2017;127(3):1117-1117. https://doi.org/10.1172/JCI92946.